Shipmate is registered a Light Brown, and is a passive Jr. Herdsire. His lineage record is 2nd to none. He has amazing genes on his dam's side like, FGA Star of Cool Fire, PERUVIAN FUEGO. His sire is Captain Morgan! We hope to see an amazing turnout with this young prodigy. He shows all the traits of a good sire! It is a joy to have him roaming the pastures. 2PACA is a beautiful Suri Jr. Herdsire. He is truly one to look out for in the show ring. He has stunning locks, full face, straight legs! 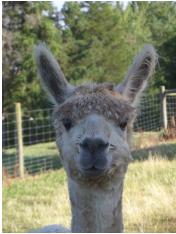 2PACA has stunning genes like PERUVIAN FUEGO, Five Star's Peruvian Maserati to name a few. 2Paca produces excellent fleece and a excellent yarn! Stargazer is a wonderful junior herdsire! He is a beige on the outside but beneath his fleece he is a wonderful silver gray! Stagrazer produces excellent tightly locked fibers and excellent yarn!